Should I get a Dairy Goat or Dairy Cow? Not only the initial investment (a dairy cow in our area will run anywhere from $1,000 – $2,000, and a good dairy goat will cost anywhere from $200 – $600) but the cost of hay/feed/etc. should also be taken into account. Cows will obviously need a lot more grass and hay, and if you get a cow from a dairy they’ll usually need grain as well (don’t make the mistake we did and try to transition a commercial dairy cow to an all-grass diet – their health WILL suffer!) We don’t feed nearly as much grain here, but in a commercial dairy situation cows are often fed 10-20 pounds of grain each day, and your cow may need large amounts of grain to keep up her body condition when in production. During the winter, we can also expect our cow to go through an entire bale of hay each day. In contrast, our Nigerian Dwarf Goats generally eat 2-3 flakes of hay each day during the winter (I think that comes to about a bale of hay each week) and at most receive 2lbs of grain each day. A friend of mine has a standard goat who eats about the same amount as our Nigerians, so this may not be a far off estimate for standard goats, also. Obviously a cow takes up much more space than a goat. I think the general rule of thumb is 1 1/2 to 2 acres per cow. Our first five Nigerians, by contrast, grazed in our front yard before we started renting the land next door and probably had about half an acre between the five of them, rotating daily in a 10×10 dog pen. That’s another great thing about Nigerians – they don’t need much room and in many places you can even keep them within city limits! 3. What kind of pasture/land do you have? Goats do well on a grass-only diet – they really need forage… bushes, weeds, trees, etc. If your pasture is primarily open fields full of perfect green grass and you want to keep it that way, a cow might be best for you. On the other hand, if you have lots of bushes/woods/etc a goat is going to do GREAT on land where a cow might need more supplementation. 4. How much milk do you need/want? A good Nigerian will give anywhere from 2-3 quarts of milk each day and a good standard goat will give anywhere from 1-2 gallons each day. A good milk cow, on the other hand, will give anywhere from 3-10 gallons of milk each day. 5. Do you want to make butter or cheese? 6. Do you want to sell milk, or start a herdshare? Cow’s milk is generally much more in demand than goats milk, and you’ll certainly have more of it to sell. On the flipside, if you have a cow and don’t want to sell milk, all that milk can get overwhelming pretty quickly! Goats milk is generally understood to be healthier and easier to digest than cows milk (with sheep milk actually being healthiest of all!) If you plan to use milk to supplement children under the age of 2, I (and many health care professionals) definitely recommend goats milk. Everyone thinks that goats milk tastes horrible, but this really is a myth! True, some breeds of goats give milk that is more “goaty” tasting than others, but if you drink your goats milk fresh, it’s not going to taste anything like what you purchase at the store! In fact, we’ve had many of our friends blindly taste our cow’s vs. goat’s milk and almost without exception, everyone has liked the goats milk better! So again, if you get a goat choose your breed wisely (actually, the same goes with cows!) 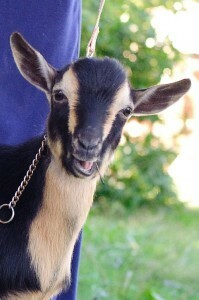 Get a goat (or cow) breed known for producing a high amount of fat, which is what gives milk a sweet taste. 9. Who will be handling the animals? Who will be milking? 10. Where will you be milking? Do you have a barn for the cow? A large dry place to milk? Do you have a place you can lock a cow who gets fussy when milked? Thankfully, our cow has a wonderful temperament and we’ve never dealt with kicking and if she’s tied to a post or a tree, she doesn’t try to go anywhere, but not all cows are this way! Some people need to lock their cows into a stanchion to milk them, so that’s a potential building/purchasing requirement to be aware of. Goats, on the other hand, can be milked on a porch or in a small shed and a simple stanchion can be made from pallet wood, if needed, and dealing with a fussy goat is a lot easier than dealing with a fussy cow. 11. Do you have a way to transport a cow? If not, realize that every single time your cow needs to see the vet, it’s going to cost anywhere from $50 – $100 just to have the vet come to your property (not to mention how much it will cost for whatever treatment is needed.) You’re also either going to need to bring in a bull, take your cow to a bull, or get your cow AI’ed every year to continue getting milk, which can be a huge hassle and expense. Goats, on the other hand, can be loaded into the back of a van or truck (or even a car!) and transported easily and it doesn’t take much to keep a buck or two if you have a large herd. Another thing to consider is that if anything goes wrong with your cow (broken leg, sudden illness, “downer cow,” etc.) you’re going to need some way to pick your cow up and move him/her. This can’t be done by inviting a few friend’s over, you’ll need a front loading tractor and other equipment. Thankfully when we had trouble with Lucy last year, a neighbor came over with his tractor to help us, but I don’t know what we would have done had we not been able to call on him for help! Goats are generally considered to be escape artists, but I think that certain breeds must be more susceptible to escaping than others. We’ve had very few problems with our Nigerians and our friend who has an Alpine/Toggenburg mix rarely ever has any problems from her goat, either. I’ve heard that Nubians are horrible about escaping, so research your breeds! Cows, on the other hand, are pretty content to stay within their fence, and one-strand electric is certainly a lot nicer to deal with than 3 or more, which is an absolute requirement for goats! 13. How much poop do you want? Goats poop little bitty berries. Cows poop great big paddies of muck. Cleaning out a goat pen is pretty simple, and doesn’t take long. Cleaning out a cow pen is a whole different story. On the upside… a cow will provide more wonderful compost for the garden than a goat will. A whole lot more! 14. Do you enjoy flies? No seriously. Cows attract flies. Lots and lots and LOTS of flies. If you plan to house or milk your cow anywhere near your home, be prepared to deal with flies in your house and around your yard… and I don’t just mean a few – I mean flies EVERYWHERE – little bitty cow flies that BITE and big huge horseflies, which also bite! Not pleasant! Goats, on the other hand, don’t attract flies the way cows do and don’t seem to attract the particularly unpleasant species of biting flies. 15. What kind of climate do you live in? 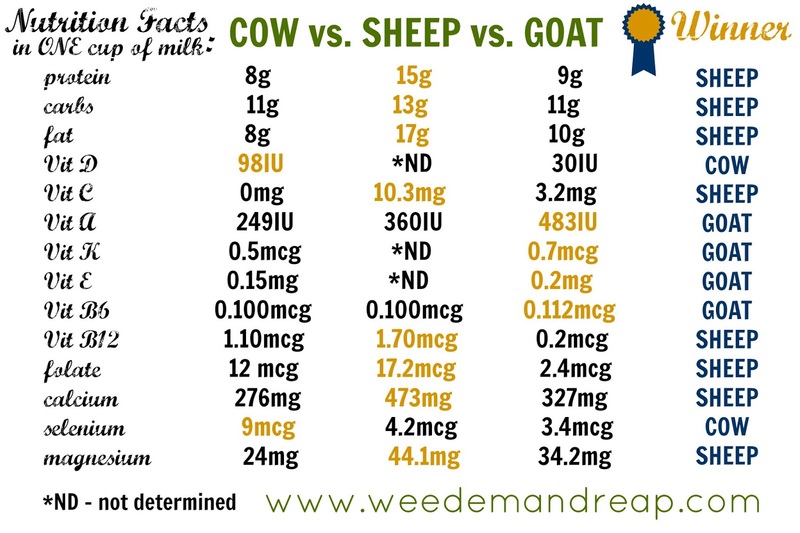 From what I understand from our vet (who grew up raising dairy cattle,) and our own personal experiences cows do better in cold/rainy weather while goats do far better in hot, arid climates. That’s not to say you can’t keep goats where it’s cold, or cows where it’s hot, but be prepared to make provisions for weather extremes. Goats need (and want!) to stay dry, especially when it’s cold out (we run heat lamps during really cold weather,) whereas cows might not eat as much during the hot months, and as a result will often drop in production. Dairy cows also have some trouble breeding during the hottest months of the year, so take that into consideration. 16. How many cows/goats do you want? 17. How much time do you have for maintenance? Cows generally don’t need to have their hooves trimmed (goats need this done each month) and don’t usually need as much worming maintenance as goats do. All in all, it seems that our goats have required more maintenance and upkeep than our cow. They also seem to need more assistance during birthing season, although that could, again, be a matter of breed (Nigerians typically give multiples which can make things more complicated when it comes to kidding.) 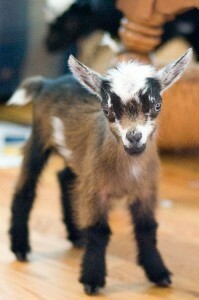 Goats typically seem to be a little more fragile than cows. One last thing I want to mention is that if you decide to get a cow, you might want to consider searching out and testing for the A2/A2 gene. There is evidence to support the theory that an amino acid in A1 milk causes problems like autoimmune disorders and neurological impairment in animals and people exposed to it. More information on that here. If you can find an A2/A2 cow who has been raised on pasture and nursed on her mother for at least 6 months, all the better! They will be much healthier and more able to handle a grass-fed diet than a cow from a dairy who was pulled from its mother and fed formula after only a few days. This entry was posted in Farm & Garden, Homemaking, PERSONAL. Bookmark the permalink.